Travis County has struck a deal to develop the property at 308 Guadalupe St., the prime block in downtown Austin that the county had formerly envisioned for a new civil courthouse, officials announced Tuesday. The lease with Lincoln Property Company and Phoenix Property Company, which plan to build a mixed-use project on the site, will bring Travis County nearly $430 million in lease payments over the next 99 years. Travis County will continue to own the property, which is currently being used as a parking lot. Officials started looking for developers to buy or lease the site last year, after voters in 2015 rejected a bond proposition to build a new civil courthouse there. The first payment of $13.4 million to be paid at closing on Wednesday is more than half of the $21.75 million that the county paid in 2010 when it bought the property from the former Austin Museum of Art (now the Contemporary Austin). That money and the future revenue from the site will help the county pay for a new civil courthouse elsewhere, officials said. The county paid for the property using certificates of obligation, which are bonds that don’t require voter approval. Eckhardt said developers will be paying off the county’s debt service in a lump sum as part of the agreement. Lincoln Property Company, which owns the Chase Tower and the 18-story office tower building at Fifth and Colorado, and Phoenix Property Company have agreed to make 10 percent of all housing on-site affordable to low- and moderate-income residents. That agreement was struck as part of the city’s density bonus program, where developers are allowed to build a larger project in exchange for building affordable housing. Developers also agreed to make a donation of a not-yet-disclosed amount to the Austin Parks Foundation to support the ongoing restoration of Republic Square, just to the north of the 308 Guadalupe St. property. The developers will also be required to follow the construction worker protection standards from Austin’s Better Builder Program. 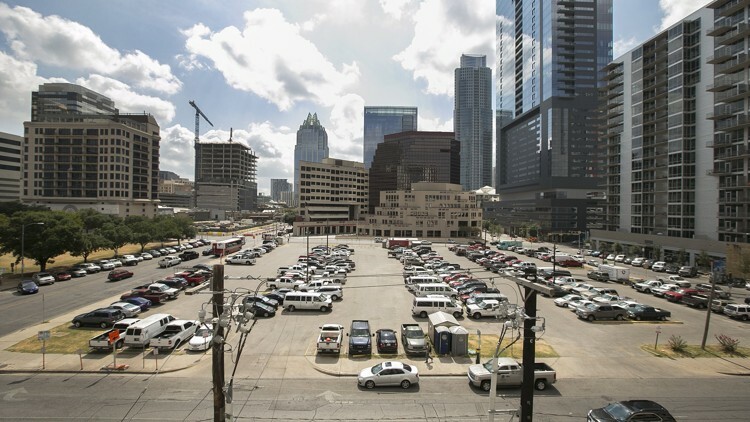 The property, now a parking lot, is the last undeveloped block downtown that doesn’t fall within any of the protected sightlines of the Capitol that could limit the height of future development. Commissioner Gerald Daugherty, whose Precinct 3 includes downtown Austin, praised the deal in a statement Tuesday. “Downtown Austin continues to be a booming and dynamic market that creates prosperity that is shared by all residents of Travis County,” Daugherty said. It remains to be seen where the county will find space for civil courthouse expansion, as was in the original plan for the 308 Guadalupe St. property. The county’s Civil and Family Courts Community Advisory Committee recommended a privately-owned property earlier this year, but officials haven’t yet divulged its location as the parties negotiate. Nearly everyone agrees that the 86-year-old Heman Sweatt Travis County Courthouse is overcrowded and dilapidated. Originally built with three courtrooms, the limestone art deco building north of Wooldridge Square now houses 19 and is in desperate need of renovation. The debate in recent years has centered around finding the right location and price tag for its replacement. Read the full story, learn more about the story so far and check out pictures of the site.